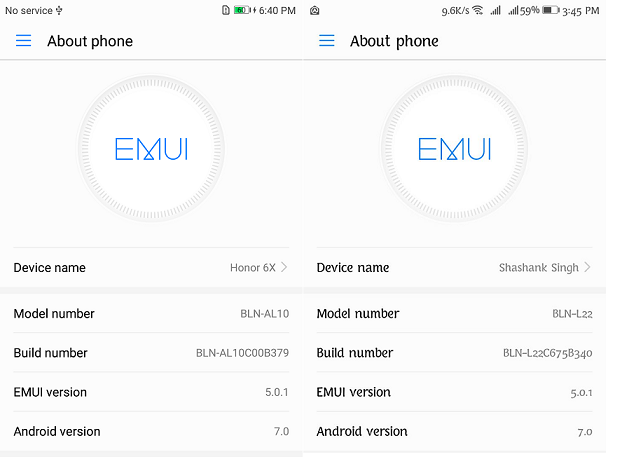 as you are aware only Indian and China variant of Honor 6X go the Oreo updates and rest all other regions are stuck with Nougat, if you want to update to Oreo, you may want to debrand to Indian or the China variant of 6X. I had China variant long back and debranded mine to Indian variant. Please follow below process for the same. Download links given below. You need to root your phone and must have TRWP installed. Let me know in case someone needs rooting method for the same. Use dload method of update and flash B340 version. Flash the data file using same dload method. Once update is finished, setup the phone and you should be having the Indian variant of 6X - BLN-L22C675 version. Steps are same and independent if you are coming from US version, UK version, EU version or any. I would make a Nandoird backup just in case something goes wrong during the process. But once you flash the OEMINFO of other region, that Nandroid backup wont work and you may need to flash the oeminfo again before you cpuld restore the backup. BTW, this is full tested and have confirmation from more than 100 users that they were able to change the region successfully. Have anybody got OREO by OTA, after debranding to indian version BLN-L22? I only got B369 and did not find anybody, who have received any newer Update. Firmware Finder list only until B367 from summer 2018.
how to flash the oeminfo ?